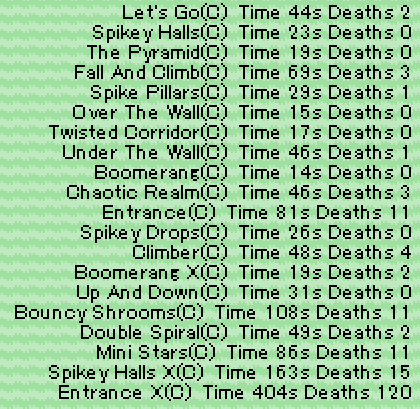 You can probably guess, but the vast majority of my Entrance X deaths were on the first jump, which took a while to even get certain of the right timing. The checkpoint would make that a lot easier though. The mechanics seem sound to me. Maybe you should denote it when you're able to beat a stage Without The Power Of Checkpoints (i.e. you're good at level start, you're not good if you respawn at a checkpoint, you're good again if you respawn at the beginning), but maybe it's not really necessary. Also I just came from doing most of the bosses no-damage in Cuphead so maybe don't listen to me. I think it's logical that a checkpoint won't count against you if it never actually gets used. But is there a reason why using them for a time but ultimately doing a complete run of the level shouldn't count? I just held right and found like the only timing that gets you between the three on the bottom and top (jump at last second almost touching the top spikes, then jump lightly at lowest point possible). You aren't saying you can stand between spikes right next to each other, right? More like the first one, though I feel like I must not be good at pressing jump for such a short time as to get a double jump that low - it feels like I'm able to make it through because I've cleared the spikes by the time I go that far up. So if it were four spikes long, I would need the super-short tap to make it. If you said something like "beat expert without needing to use a checkpoint," that would make sense to me. reading your post more closely it sounds like you did something like this? Yeah, that's it. My keyboard can do taps that let me double jump less than the distance between the spikes, it's just tricky. "Beat expert without respawning at a checkpoint"?